After a long spring that has limited hiking to the lower trails, I was thrilled last weekend to make it to the forks of Cascade Canyon. The trail was reasonably clear to the forks, but snow started to mount at the junction. So, I wondered, why not dust off the cross country skis and go all the way to majestic Lake Solitude? So yesterday, with a pack borrowed from a friend, I began a unique adventure: ride the Jenny Lake Boating shuttle across Jenny Lake, hike up Cascade Canyon to the forks, and finish the trip at Lake Solitude via a combination of hiking and cross country skiing. The final tally: around 14 miles. The trip did not disappoint! The views of the Tetons through Cascade Canyon are spectacular, and they just get better and better on the trail from the forks to Lake Solitude. The lake itself, set into a cirque at 9,035 feet, is gorgeous, surrounded on three sides by mountains. This can be a popular trail in the summer, but I had the lake to myself yesterday and enjoyed some brand-name Solitude. There are several trail options in this area. 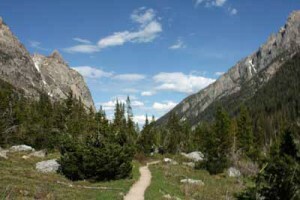 You can start in the String Lake area, hike up Paintbrush Divide and come down into Lake Solitude, then follow Cascade Canyon back to Jenny Lake and hike along the shore back to the String Lake area. This is a tough 20-mile loop with some serious elevation gain over Paintbrush Divide. It’s also spectacular – the view from Paintbrush Divide of the valley is awesome, and the view of Lake Solitude and the Tetons as you descend Paintbrush Divide into Lake Solitude is awesome. You pass through three camping zones on this loop, so it’s easy to turn it into an overnighter. Unless you’re a die-hard, you’ll want to wait until later this summer for this adventure. 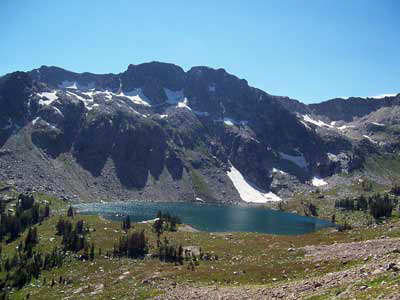 The other main alternative is to hike up Cascade Canyon, ending at Lake Solitude and retracing your steps back home. Additionally, some people see Lake Solitude as part of the multi-day Teton Crest Trail, starting their adventure further south in the Tetons, traversing through the heart of the Teton Range, and coming out via Paintbrush Divide and String Lake. This article will describe the trip up Cascade Canyon to Lake Solitude. I hope to write about the Paintbrush Divide loop after I have done it again later this summer. I won’t go into many details about Hidden Falls and Inspiration Point; I’ll write about them in a separate entry. To start this trip, you have three good options. First, you can ride the Jenny Lake Boating shuttle, which will save you four-miles (round trip) of hiking and offer you awesome views of the Tetons and Cascade Canyon as you take the five-minute trip across Jenny Lake. The round-trip shuttle costs less than $10 (one-way tickets are also available). The captain of your shuttle boat will be glad to answer any questions you have about outdoor adventures in the area. I should mention that I am friends with the owners of Jenny Lake Boating. 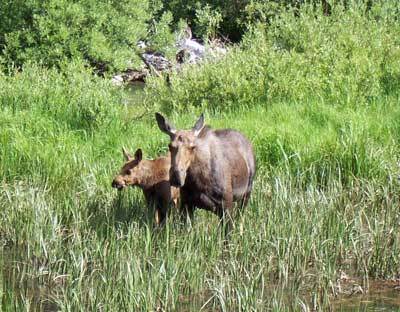 Second, you can hike two miles along the south and west shore of Jenny Lake from the South Jenny Lake village area. After two miles, you will approach the west Jenny Lake boat dock and are about a half mile from spectacular Hidden Falls and 0.9 miles from Inspiration Point, which rises more than 400 feet above Jenny Lake and offers an “inspirational” view of the lake. Third, you can hike along the less traveled northwest shore from the String Lake area to the Hidden Falls area. You’ll spend part of your trip in an area that was burned recently by fire. From the west dock / Hidden Falls area, you have two options to get into Cascade Canyon. You can hike back to Hidden Falls and Inspiration Point, then continue along the trail into Cascade Canyon. Alternatively, you can bypass Hidden Falls and Inspiration Point (and the crowds) and save a little time by taking the horse bypass trail. The horse bypass trail begins a few minutes north of the dock along the shoreline trail. From this junction, you are 4.1 miles from the Cascade Canyon forks. You’ll climb for 0.8 miles up a fairly steep trail into Cascade Canyon, walking through forest virtually the entire way, before you come to a junction. The trail from Inspiration Point and the horse trail unite here. Continue up Cascade Canyon; you are 3.3 miles from the forks. 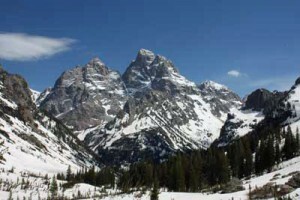 Over the next 3.3 miles, you will pass through the shadows of Teewinot Mountain, Mount Owen and the Grand Teton to the south. It’s amazing to watch the views of these enormous mountains change as you proceed up the canyon. For example, Teewinot is dominant on the east end of the canyon, but barely visible on the west end. You’ll also enjoy the view to the north. You might see some mountain climbers taking advantage of the cliffs along the way. And depending on the season, you could see various waterfalls tumbling down the walls of the canyon from snow melting above. The trail goes straight up the glacially carved Cascade Canyon, following Cascade Creek the whole way. 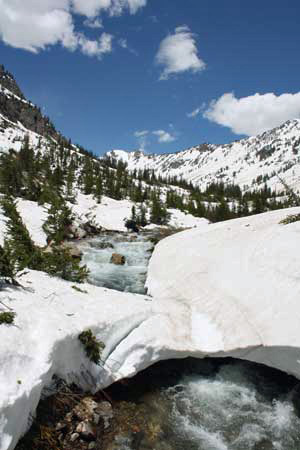 The creek flows quickly in some areas – in one area near the mouth forming a cool cascade – and slows down in others. I’ve seen moose lingering in these waters twice near the forks. If you’re a photographer, this creek creates some interesting compositional opportunities at the base of the mountains. And along the way, you’ll see plenty of large boulders, including some perched precariously on each other. As you climb Cascade Canyon, you’ll spend some time in forests and some time along rocky slopes. Once you get past Inspiration Point, the elevation gain to the forks is minimal – the elevation at Inspiration Point is 7,200 feet. Over the next approximately 3.5 miles to the forks, you’ll gain about 650 feet, but the elevation gain is so gradual that you’ll barely notice it. Near the forks, Cascade Creek – ultimately flowing out of Lake Solitude – meets with another creek flowing from the south. You’ll cross a bridge near where they join; the forks are just a few minutes past this bridge. This seemingly humble junction is a major crossroads in the Teton backcountry. Teton Crest hikers come through this junction, with some choosing to come out Cascade Canyon and others continuing north to Lake Solitude and coming out over Paintbrush Divide. If you take the southern trail, you can get to Hurricane Pass, Alaska Basin, Death Canyon, Granite Canyon, Jackson Hole Mountain Resort – and even the Teton Pass highway. To get to Lake Solitude, you want to turn north; you’re 2.7 miles from the lake. However, before you do, I recommend a short detour along the south trail. Near the junction, you can see a cascade; if you continue for just a minute or two up the trail to Hurricane Pass, you’ll have a better view. The trail to Lake Solitude will reintroduce you to elevation gain; from the forks to Lake Solitude you’ll gain about 1,200 feet over 2.7 miles. The gain is fairly evenly spread over the 2.7 miles of trail, although the final ascent to Lake Solitude will leave you winded. The views and the feeling of being surrounded by the mountains, however, make it worth it. The first stretch of this trail winds through forest, crossing another bridge over Cascade Creek upstream from the Cascade Canyon forks. After this bridge, the forest will start to thin out, opening into an absolutely gorgeous canyon. The canyon is longer than it appears from this point, so don’t be fooled – you’ve still got a ways to go to get to Lake Solitude. But you’ll enjoy this trip, with the stunning Wigwams to the west, the end of the glacial cirque to the north, and imposing Paintbrush Divide to the east; if you look, you’ll be able to see the trail carved into the mountain descending from the divide. And don’t forget to look behind you as you continue up the canyon – this view of the Grand Teton is one of the best-up close vantage points in the entire park. Early in the season, you’ll see snow accenting the mountains. Later in the season, the wildflowers come out. 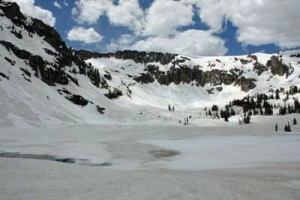 Lake Solitude can remain frozen into July. You’ll continue to follow Cascade Creek until you come to Lake Solitude. You’ll cross a small bridge not quite halfway between the forks and the lake. Also, you have the option to make this trip an overnighter; about half of the area between the forks and Lake Solitude is a backcountry camping zone. And after you finish the ascent up to Lake Solitude, you’ll enjoy a beautiful, pristine mountain lake. It’s probably the most popular backcountry lake in the park, and it’s easy to see why. Tucked into a glacial cirque and surrounded on three sides, with the Grand Teton looming to the south, it’s tough to beat this scene – especially considering the moderate difficulty of the hike. Over about seven miles from the shores of Jenny Lake, you gained 2,252 feet, mostly fairly gradually. 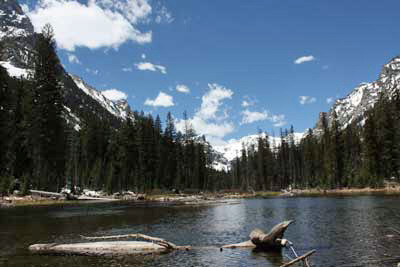 Bring a camera and pack a lunch; Lake Solitude is tough to beat as a picnic area. Also, it’s interesting to note that Lake Solitude is barely in Grand Teton National Park. The boundary with the Jedediah Smith wilderness is less than a mile to the west. To get home, retrace your steps, enjoying the views of the Grand from Lake Solitude to the forks. If you’re going to take the shuttle across Jenny Lake, be sure to leave yourself time to get back to the boat dock before the final boat of the day leaves. The schedule varies throughout the season; details are at JennyLakeBoating.com. Also, be aware that trail conditions will vary throughout the season. Two years ago, I hiked to Lake Solitude on the Fourth of July. The trail was clear of snow for all except the final mile or so before the lake; this stretch of trail was partially snow-covered and the lake was still slushy. Most likely, the snow will linger even later this year. On my combined hiking/cross-country skiing adventure yesterday, I ran into several people who had just hiked back to the lake. If you’re not afraid of a lot of snow, you can get back there. As of yesterday, the trail from Jenny Lake to the forks was mostly clear of snow, with steady – and considerable – snow cover beginning just after the forks.